Clinton KY - The Fourth Annual Hickman County Heritage Days celebrates the long and rich history of Hickman County, the first Kentucky county in the Jackson Purchase. Heritage Days are unique in the multiple groups that celebrate. With the exception of the Landscape Workshop which has a small charge, all the events are free and open to the public. This year's theme is Art of Our Ancestors. Heritage Days this year coincide with the 200th anniversary of Andrew Jackson's purchase of all the land west of the Tennessee River. 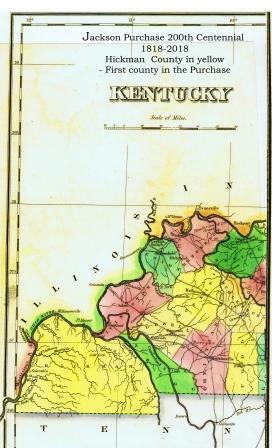 The Purchase includes eight Kentucky counties, Ballard, Carlisle, Fulton, Graves, Hickman McCracken and Marshall Counties. Jackson's purchase of Cherokee hunting lands was spurred by the threat of English, French and Spanish interest in controlling the Mississippi River. The Purchase put an end to those foreign ambitions. The Hickman County Historical Society, 141 S. Washington Street, Clinton, will commemorate the 200th birthday of the Purchase on Thursday, September 6th from 11-2 with a luncheon, birthday cake, speakers and displays. Representatives of the Cherokee Nation are invited to participate. The Historical Society is a Trail of Tears education center because the Benge Trail of several thousand Native Americans crossed the Mississippi River at Columbus Kentucky. At right, early map - Purchase is section in yellow at western end of the Commonwealth. 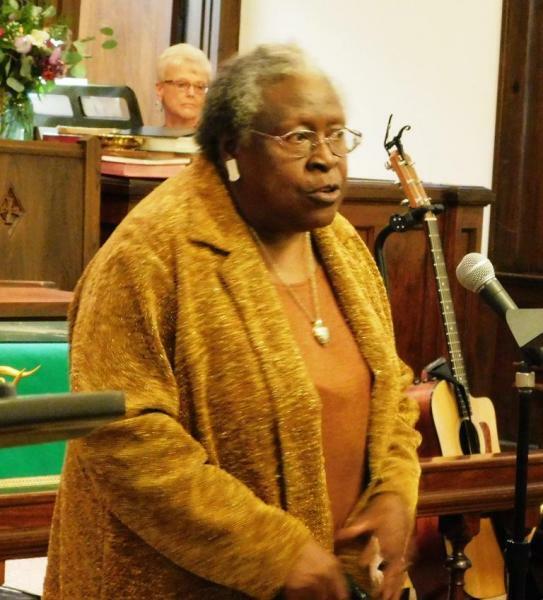 Religion and singing have always been a big part of the pioneer heritage and the Old Hymn Sing brings together local musicians singing and playing old time hymns. Congregational hymn singing is a big part of this nondenominational event. Back again this year is Miss Helen Greer, shown above, whose foot stomping a capella "Old Time Religion" was a high point in 2017. A cross section of local musicians from the young to the not so young will be sharing their talents. Many of the songs become singalongs. All music, gospel and hymn, are carefully chosen by a committee to include no music written later than 1950. 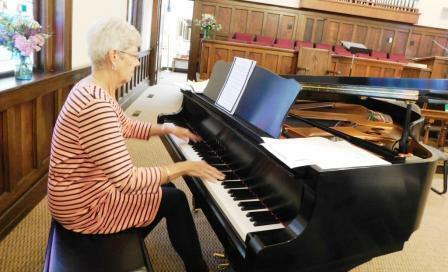 Janie Templeton on organ and Sharon Cagle on piano, shown at left, will open the event with a concert from 6:30 - 7:00. The event is free to the public. Clinton First United Methodist Church, 201 S. Washington St. Clinton. Rat rods, old cars, trucks, and motorcycles will be on display at Rumble on the River on Saturday, September 8th. Show opens at 8:00 a.m. No admission fee. Donations and drawing proceeds benefit the relocation of the Columbus Clock. 2018 Hickman County Heritage Days listed below. Historical Society- Commemorating the 200th anniversary of the Jackson Purchase 10-2 Hickman County Historical Society Building. 107 S. Washington St., Clinton. Lectures, lunch, displays and cake. Cherokee and Chickasaw representatives invited to share their perspective. Landscape Painting Art Workshop 5-7 - Young Center of the Clinton First Methodist Church. Cosponsored by Hickman County Art Council. Applications at Clinton and Heartland Community Banks. Workshop $10 for supplies. Class limited to 15. Library/Women's Club: Daisy Craig Art Show Clinton Woman's Club presents "Landscapes of Hickman County" and other pieces of interest 2:00 pm. Local musicians. Congregational singing. Free admission. Love offering benefits Hickman County Senior Center, Darrell and Thomas Sims air conditioning fund and Ministerial Association. Rumble on the River Car Show 8- 12 open for entries. Awards at 3:00. 25 classes, over 80 awards. Cars, trucks, motorcycles, rat rods - Columbus Belmont Park. 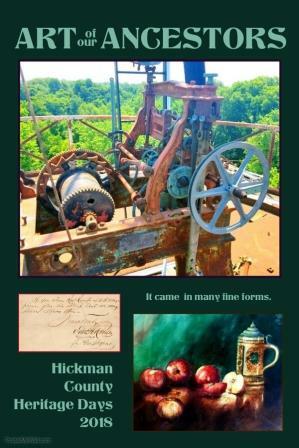 Proceeds benefit Columbus Pride Community Fund - first goal to move and repair Columbus clock.